Did you know that store canned items are lined with BPA? BPA may leach into foods. If you don't know what it is, you should find out. The FDA recently advised consumers to reduce their exposure. When canning any type of meat, you need to use the leanest you can find. Too much fat is likely to cause the meat to develop a strong flavor and may also contribute to seal failure. 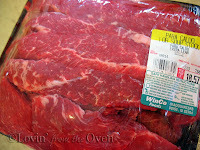 Winco had this "Para Caldo" meat. I had no idea what this meant, so I asked for the butcher. Out comes this verrrrrry young man. Yes. What type of meat is this? "It is a lean meat that you can use for soups or anything you want." I'm pressure canning some meat. I need a really lean meat. Would this work? "I'm sure it would. How much do you need?" I need fifteen pounds of the leanest stuff you got. "Well, I would cut some up for you, but we just sterilized the room. If you come tomorrow, I could cut some and trim it up for you." Great! What time should I come over? "Anytime in the morning...how about 10:30?" There's something about getting to know your local butcher. They can find exactly what you want and cut it up for what you need. The next morning, I walked over to the butcher door and saw a lady standing there. "O.k. I'll go back and check. Out comes another lady with a big, black apron. "Hi. Are you the gal with the 15 pounds of meat?" "Yup. I'll be right back." For a split second, I thought I had been stood up. The lady came out with two large trays of meat, neatly trimmed and packaged. Thanks, Tyler, I thought to myself. I wish I could've thanked you in person. He did a great job of trimming the meat! The easiest, quickest way to cut the meat was my kitchen shears. 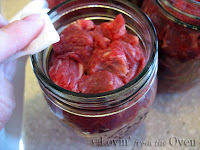 The meat is put in clean jars. 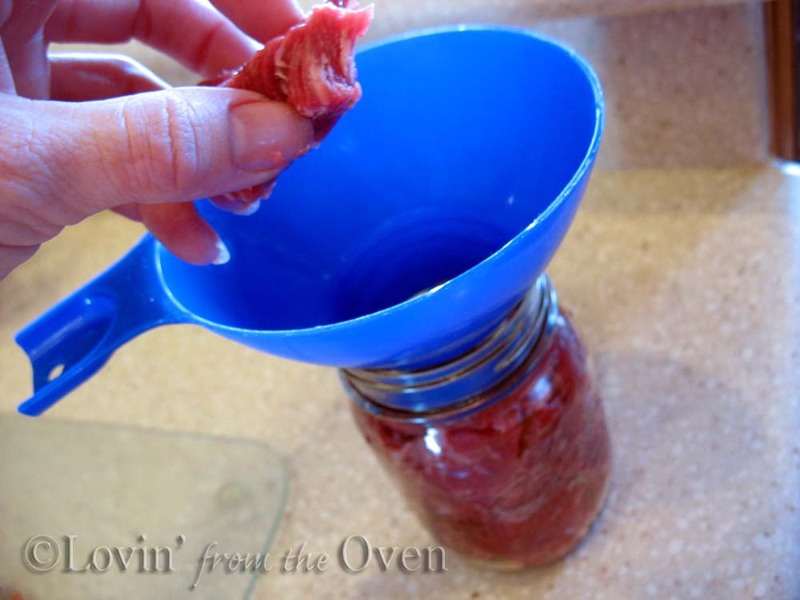 I love this funnel that comes with a canning kit. It keeps the jar rims clean and dry. 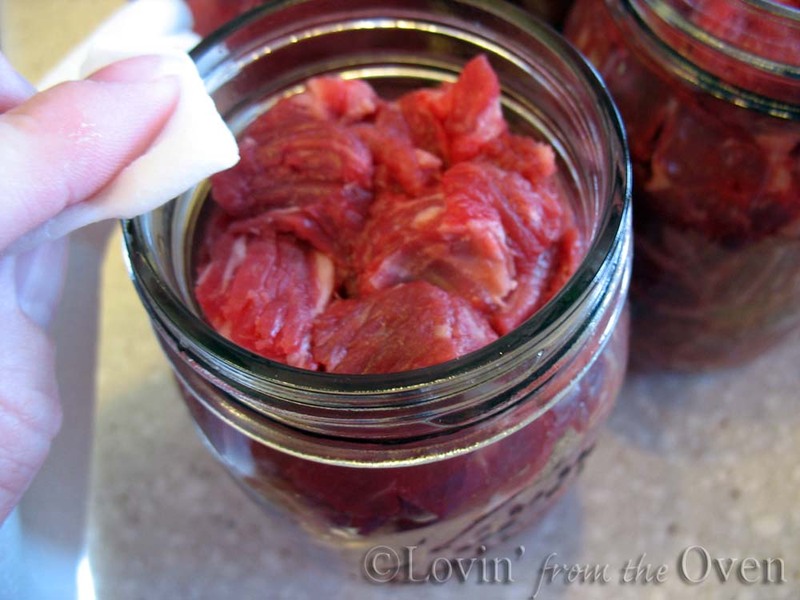 Pack the meat tightly into the jars, filling them up to the first thread, 1" from the top. I was able to squish about 1 pound of cubed meat in each pint jar. Next, take a clean, damp paper towel and wipe off the rims. Just to make sure they're clean. Clean rims = sealed jars! and screw the ring snugly on. It's important NOT to screw it on too tight. Some air needs to escape the jar and promote a good seal. 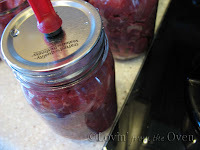 I use a jar lifter to place the jars into the boiling water of my pressure canner. Note the required rack on the bottom. 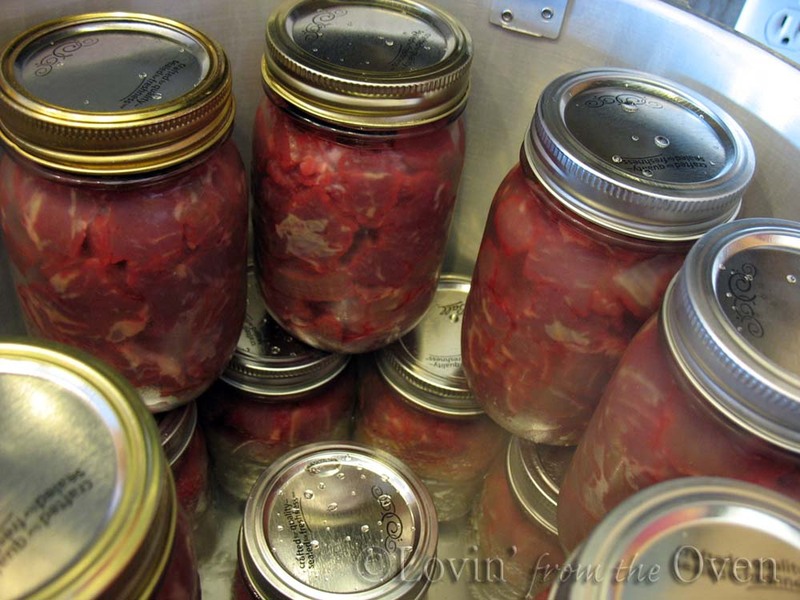 I am able to stack 15 pints into the 22 quart pressure canner. 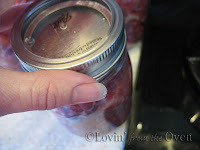 I make sure each jar of the second layer is stacked on the rings of the two jars below it. Some pressure canners have an additional rack to create a second layer. 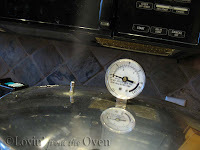 When there is a steady stream of steam from the vent, I set the timer for 7-8 minutes. Where I live (over 5,000 feet altitude), the recommended pressure is 13 pounds. 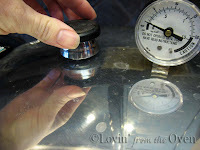 Check the canning altitude chart for where you live. This pressure is kept at 13 pounds for 75 minutes. My gas stove is turn off (if you have electric, you will need help moving the canner to an unheated part of your stove). 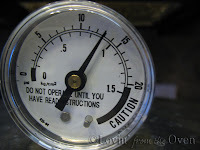 When the pressure is at "0", the regulator is removed. Wait 10 minutes and using the jar lifter, each jar is removed and placed on a towel covered heat-proof surface. When the jars have spent 12-24 hours cooling, they are cleaned off and dated. Thoughts: I was surprised at how much time it took me to cut up the meat. 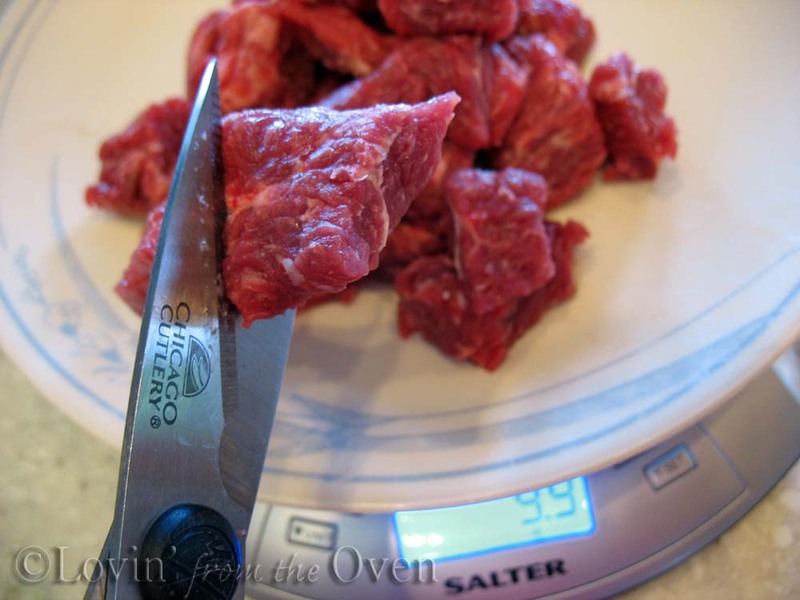 Having a helper or paying extra for cubed meat may be ideal for you. I was also surprised at how pretty and brown the meat was. I was expecting dull, gray meat. There is plenty of moisture in very fresh meat. No added broth was necessary. I also did not add salt. How cool is that? If you noticed, there is a very thin outside layer of fat on the top. This is minimal. It could be scraped off, or used in the broth. Now you've seen how it's done and how easy it is, do you want to try? How long does the meat keep? 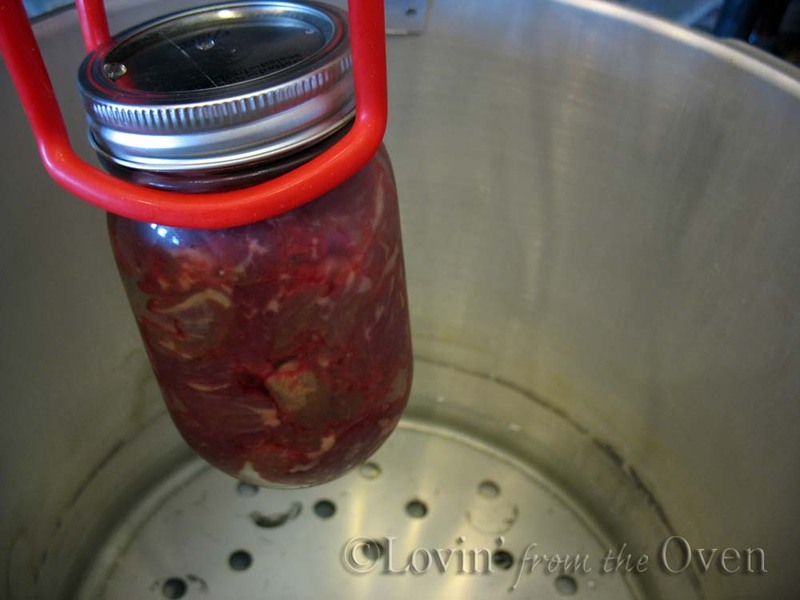 Does it need to be cooked at all when it comes out of the jar? Fantastic tutorial. I couldn't find a good chicken one when I tried it last year, so I am glad I have this to look at if I try beef! Thank you. 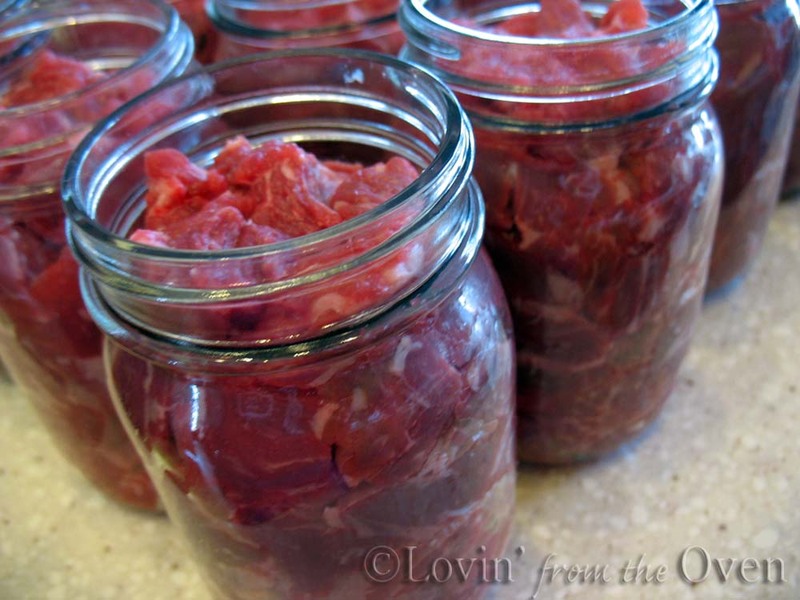 My mom pressure canned venison while I was young and it was good - seemed to loose its "wild" taste after being canned. I really should get her to do this with me with our next deer Grumpy gets! 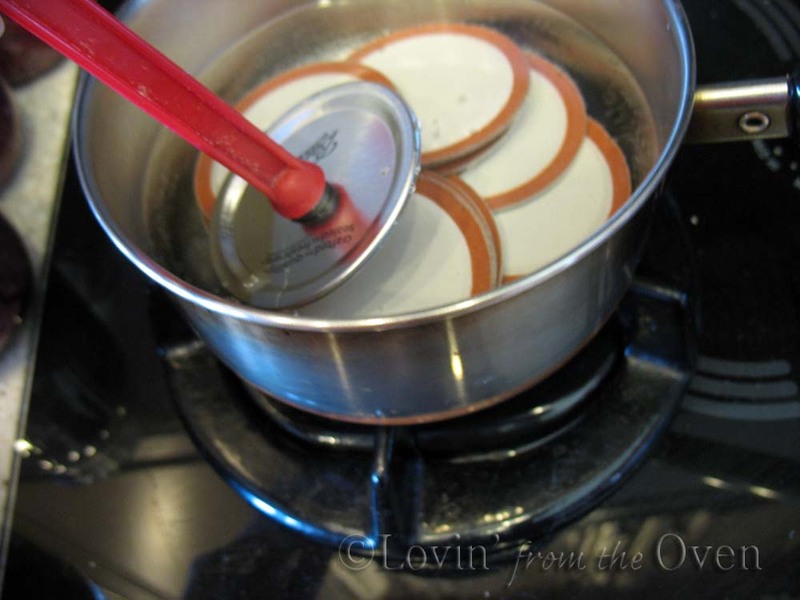 I always have been afraid of the pressure cooker but you make it seem so easy! Canning venison would be a great idea! This is what my Blue Ball Canning bible says: The flavor and texture of canned meats depend upon the breed, feed and manner of handling the meat at the time of slaughter, and immediately after slaughtering. If you slaughter your own meat, contact your county Cooperative Extension SErvice for info on slaughtering, chilling and aging the meat. Do not let meat stand in water. However, strong-flavored game should be soaked in salt water before canning. Soak game 1 hr. in a salt brine (1 T. salt for each qt. of water). This is so incredibly helpful. I would never have thought to can meat. 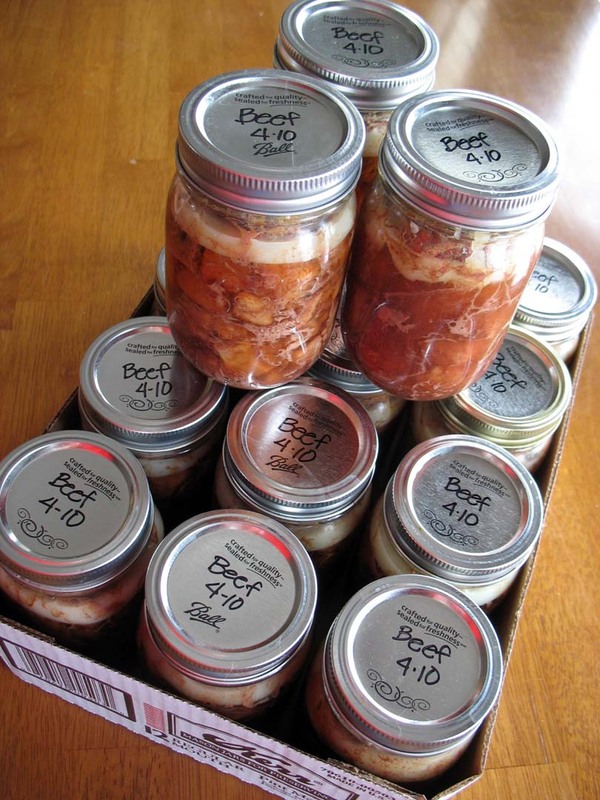 I've been thinking more and more about putting up more food, so it's so interesting to see what really can be done with canning. I can't peruse as much as I'd like at the moment, but you can be sure I'll be back to read through all of your canning posts! Thanks Frieda - you're a cooking wiz! Freida, have you ever tried canning dry beans? That's something I've wanted to try but haven't. Also, how much did you pay for your beef? 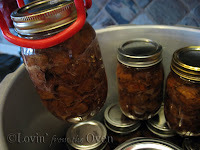 Micah, I have never tried canning dry beans. I have heard that canning Pinto beans works really well. Commercially canned beans have an additive added to keep them from splitting. When you can your own, they will split, but will work great with a chili. You will have to can the chili and the beans separately. I thought I paid $2.25/lb for the meat, but I clicked on the photo and it was $2.45/lb. A good deal, considering that it was trimmed and pretty lean prior to packaging. You may find better deals, but more fat in the meat.